Top coat, Signature Series Magic-Glos® by Lisa Pavelka, non-toxic dimensional gloss. Sold per 1-fluid ounce. Item Number: H20-4480BS Have a question about this item? Signature Series Magic-Glos® is a one-step top coat for sealing and protecting polymer clay and other craft masterpieces. The non-toxic, odor-free dimensional gloss dries crystal clear with direct sunlight or UV light for a waterproof finish. Mix with glitter, dried flowers and other materials to add dimension to designs. Instructions included. • Once applied to baked clay, Magic-Glos® can be applied and baked over and over again. • Wonderful for sealing transfers, foils, leafing mosaics and more! • Easily creates enhanced faux dichro effects and domed cabochon effect with multiple layer applications. • Ideal on creative surfaces to add shine or dimensional effects such as water droplets, raised patterns, etc. Top coat, Magic-Glos® by Lisa Pavelka, dimensional gloss. Sold per 6-fluid ounce bottle. 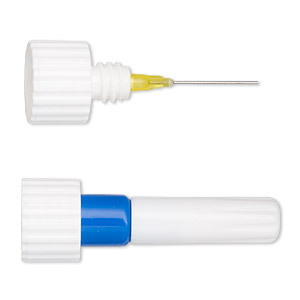 Nozzle, aluminum / plastic / steel, white and blue, 2-3/4 x 1 inches with 1mm tip, for use with Magic-Glos® 1-ounce bottle. Sold individually. 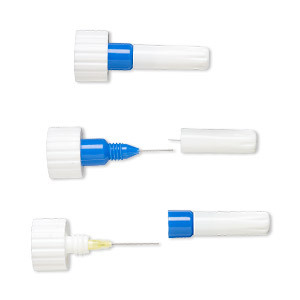 Nozzle, aluminum / plastic / steel, white and yellow, 2-3/4 x 1 inches with 1mm tip, for use with Magic-Glos® 6-fluid ounce bottle. Sold individually.